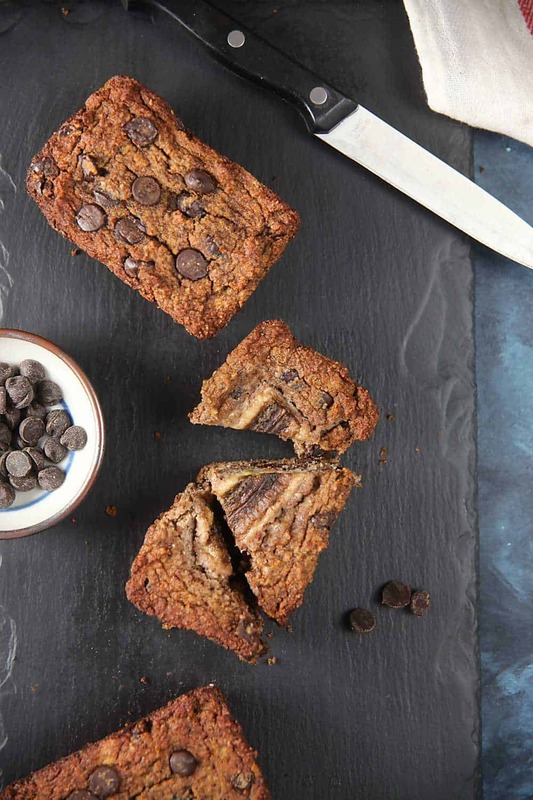 Paleo Chocolate Chunk Banana Bread (Gluten Free) | Healthy. Delicious. 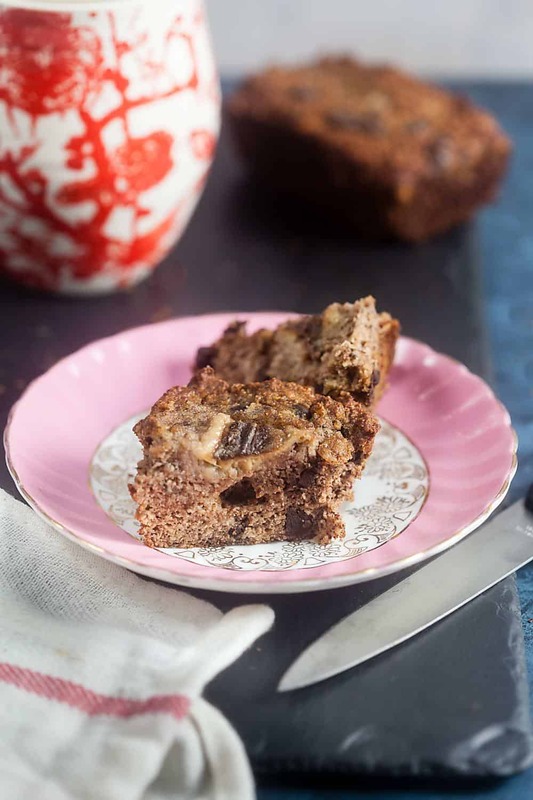 This paleo chocolate chunk banana bread is so soft and tender you’d never guess it’s gluten and dairy free! I’ve been craving bananas a lot lately. The problem is, I keep buying them and then completely forgetting about them. So now my freezer is stuffed full of overripe bananas. That means one thing – banana bread! This was my first time trying paleo banana bread, and I have to say I’m completely wowed. The texture is perfect! Photos don’t do this banana bread justice. There’s just no way to show you how unbelievably soft and squishy it is – you’ll just have to take my word for it. (Or make it and see for yourself!) Straight from the oven, it’s super soft and almost cake-like. After spending a night in the fridge, it firms up and its practically indistinguishable from traditional quick bread. 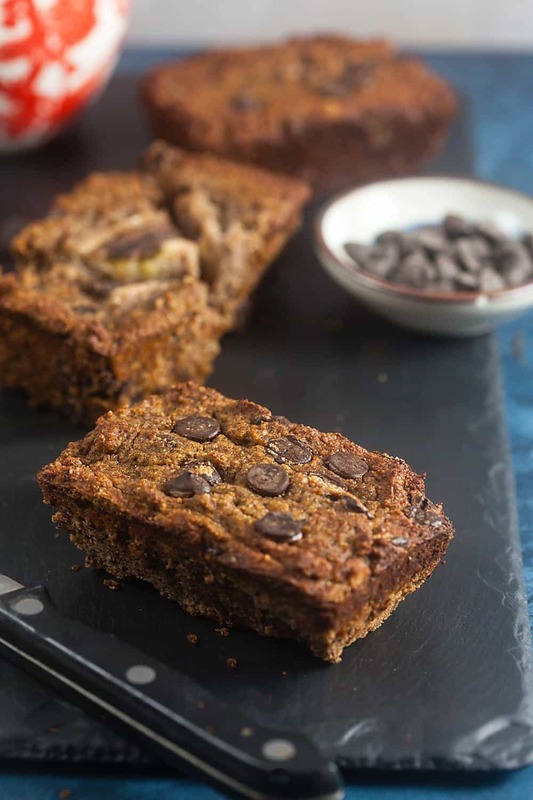 Dairy free chocolate chips or pure cacao chunks add that little something extra that makes this banana bread a real treat. 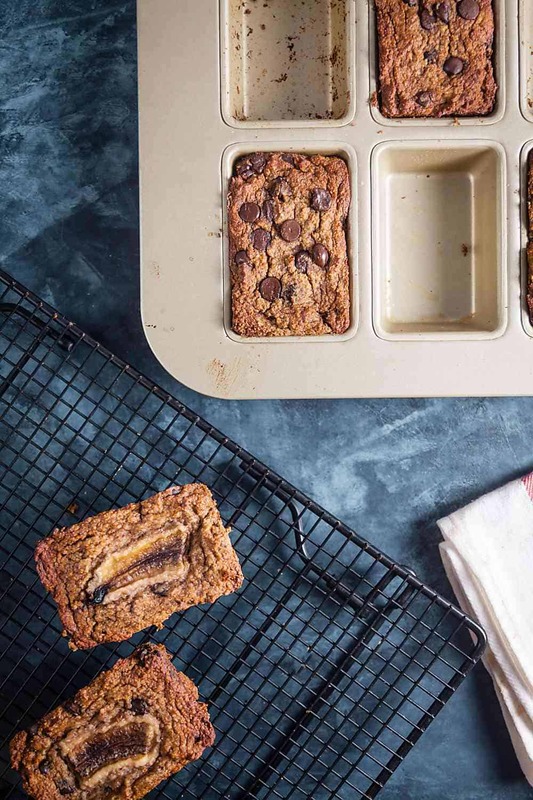 I knew I didn’t want either of those things, so I took a gamble and used a combination of almond flour and coconut flour for this paleo chocolate chunk banana bread. Since the coconut flour requires a little more liquid, I added more mashed banana than normal. I also sweetened this paleo banana bread with maple syrup and added a generous dash of cinnamon for an extra level of flavor. The bread is super soft and prone to falling apart into giant crumbs when it’s first baked. I found that it held together best when baked in mini loaf pans. If you prefer a full size loaf, bake the bread for 45-55 minutes and allow to cool completely, then refrigerate for an hour before removing it from the pan. Looking for more banana bread recipes? Try my Cajeta Banana Bread or Dairy Free Banana Cupcakes with Brown Sugar Buttercream. Heat your oven to 350ºF. Spray six mini loaf pans with cooking spray. In a bowl, sift together the almond flour and coconut flour. Stir in the cinnamon, baking powder, and salt. In a second bowl, beat together the eggs, milk, maple syrup, and vanilla. Mash in two and a half bananas until smooth. Stir in the dry ingredients until incorporated. Stir in the chocolate chunks. Divide the batter among the loaf pans. If desired, lightly press slices of the leftover banana into the top of the batter. Bake 30-35 minutes, or until the edges are browned and the center is set. Let cool completely before carefully removing from the pans. I freakin love banana bread! I always get happy when I come across a new banana bread recipe! This beauty is definitely on my to do list! Thank you for sharing! Banana bread is a hit no matter how you make it! Love this version.